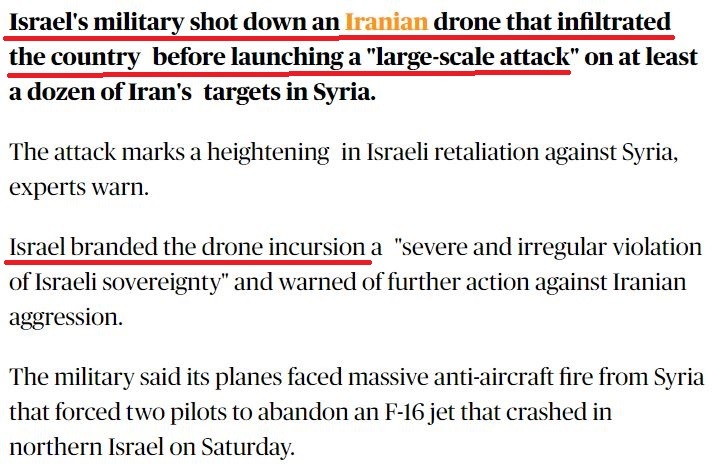 As our recent review of UK media coverage of the incursion, last week, of an Iranian drone into Israeli air space, and the IDF’s subsequent response, revealed, the most misleading article was published by the Evening Standard. We tweeted our concerns and followed up with an email to editors at the London regional daily over several issues, including the headline and opening sentences. We explained to editors that the headline falsely suggested that Israeli attacks on Syria were launched due to the crash of an Israeli F-16 fighter, when in fact the conflict began when an Iranian drone violated Israeli airspace. The F-16 crashed following Israel’s retaliatory strikes on Syrian and Iranian targets. Editors agreed, and changed the headline to reflect the correct sequence of events. We also complained that the text of the article was confusing, misled on the sequence of events and included erroneous claims. 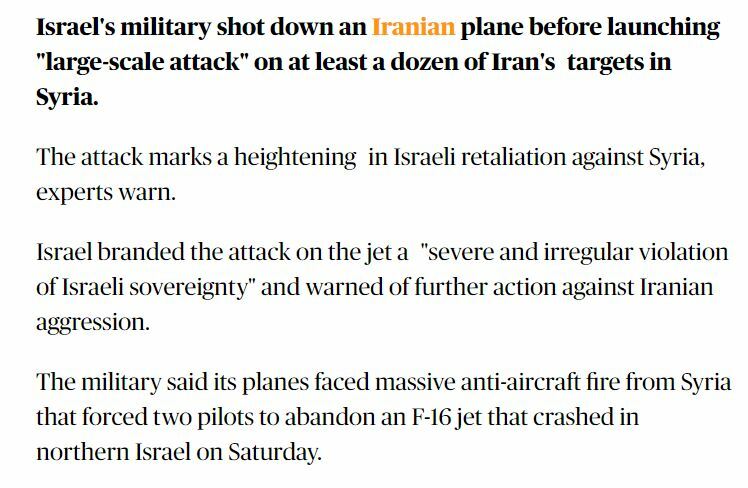 One such false claim, in the opening sentence, was that “Israel’s military shot down an Iranian plane“. Of course, it was a drone (UAV), not a “plane”. The second and third sentences are muddled, rendering it nearly impossible for readers to decipher what actually occurred. Editors revised these sentences, which are now far more accurate as to the cause of the incident and subsequent events – and, most importantly, now identifies the Iranian drone’s penetration of Israeli air space as the event which triggered hostilities on Israel’s northern border. We commend editors on the substantive correction to the original article. Stephen really even you should be able to appreciate the importance of the humble comma. If you can hear a noise it is dear old Oscar Wilde spinning in his grave. Aw, poor little Bellamy and poor little Farmer, UKMW has forced corrections to the joke that constitutes the British press.